Emery “E.O.” Johnson, founder of the E.O. Johnson Company, led his office technology company as CEO for 42 years before turning over the CEO responsibilities in 1999 to his daughter, Mary Jo Johnson, who had worked with him in the business for 14 years. What began as a one-man office in Wausau in 1957 is now E O Johnson Office Technologies, a leading regional provider of print, document, and IT management solutions with four locations and 180 employees. E.O. 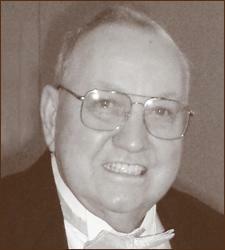 Johnson was born in Iola, Wisconsin in 1921. After graduating from Iola High School in 1940, he attended Milwaukee Vocational School and Marquette University, and then joined the Army, serving in the South Pacific during World War II. Following the war, in 1946, E.O. Johnson began a 10-year career with the Victor Adding Machine Company in Milwaukee. He married LaVerne Riemer in 1952, and the couple had two children. After rising to the position of sales manager, E.O. Johnson decided it was time to start his own business. In 1957, he cashed in some insurance policies and other assets to raise the $20,000 he needed to open a 3M copy machine dealership in Wausau. Johnson was the only employee at his original office on Third Avenue, and with little capital available, growth came slowly. But E.O. Johnson persisted and by 1967, the company had another office in Eau Claire, nine employees and $450,000 in annual sales. The company really began to take off in 1979 when Johnson added a new line of advanced copiers and office equipment from Canon, a brand that would become the best selling brand of copy machines in the U.S.
During the next 10 years, E.O. Johnson continued to expand by aggressively embracing color copy machines and emerging digital technology. In 1990, E.O. Johnson purchased the Computerland franchise in Wausau and established one of the first dealer partnerships in the region with Hewlett Packard. To help his customers apply the new digital technology to their businesses, E.O. Johnson and his staff developed their own training programs. E.O. Johnson was a great mentor for his employees and management team and very committed to helping them succeed. By 1996, the 104 employees in his company were selling and servicing more than $10 million worth of office technology and services each year to businesses all over central, northern and western Wisconsin. That same year, E.O. Johnson was recognized by the Business Products Council Association as the National Dealer of the Year from among 3,800 other dealers. E.O. Johnson served on numerous committees and boards, including the Wausau Area Chamber of Commerce, Peoples State Bank, and the North Central Technical College Foundation to name a few. He was a huge supporter of United Way, and in 2008, he received the Tocqueville Award – United Way’s top honor. He also provided significant financial support to many area youth organizations, health-related programs and other local projects. At age 78, E.O. Johnson decided to retire, although he continued to work part-time for nine more years. Today, E.O. Johnson Office Technologies has offices in Wausau, Eau Claire, La Crosse and Rochester, Minnesota with annual sales approaching $35 million. E.O. Johnson passed away on February 2, 2011 at the age of 89. Junior Achievement of Wisconsin’s North Central District is proud to honor E.O. Johnson as a 2011 Champion of Business.